Purchased in 1944, this Urbana park is named after Joseph C. Blair. Looking ahead to serve future community needs has been a hallmark of the Urbana Park District for more than half a century. While some in the community believed that Urbana would not develop as far south as Blair Park, the Board of Commissioners felt otherwise, and today Blair Park is a hub of activity in an area where multiple neighborhoods intersect. Located between Florida Avenue, Vine Street, Broadway Avenue and Pennsylvania Avenue, this 11-acre park was purchased by the park district on March 23, 1944, in anticipation of the southern growth of post- World War II Urbana. The land had already been annexed into the city ( 1924). Some residents initially opposed the purchase, citing the need for new homes in the area, but park commissioners reasoned that there was "plenty of room" for a park that would be convenient to the high school and proposed junior high school. It was also anticipated that land values would increase in the area with residential development, and the park's location would add to that value. In 1944, commissioners A. S. Colby, Alex Bowers, Lester L. Corrie and A. I. Lauchner signed a resolution naming this new park in honor of Joseph C. Blair, park district president since 1919. On the west side of the park is the Rourke Memorial Shelter, whose cornerstone was laid on October 9, 1952 by commissioners Karl B. Lohmann and George Hurd. Two years later, on October 16, 1954, the Rourke Memorial Shelter was dedicated as a gift from Nancy C. Rourke in memory of her husband, Charles D. Rourke, an original park commissioner (1907-1916). David C. Busey, another original commissioner (1907-1917), bequeathed funds for the construction of three tennis courts in 1953; a stone marker honors his gift. A 1953 park district brochure describes Blair Park as having the following: a model airplane flying area, archery targets, a ball diamond, shelter, and a playground. In 1956, a stone monument was erected facing Vine Street, which was inscribed in honor of Joseph Cullen Blair for his long time active service (1907 -1947) both in the establishment and development of the parks of Urbana. All of the stone for the monument was donated. The stone was quarried to size and numbered according to a plan by William Gossard of Fisher. As the newest park in the district, Blair Park was developed as a youth-centered recreational area. By the Urbana Park District's fiftieth anniversary in 1957, the park contained the Rourke Shelter, three baseball fields, tennis courts and a play area for children, including a special enclosure, the "Kiddie Korral:' This play area was constructed in 1954 and was termed by some as a "Disneyland type of playground" complete with comic characters, slides, and games for children through age ten. Special recreational activities for youth were held at the park including archery tournaments. At this time, ballgames were sponsored by the Little League, the Junior Chamber of Commerce, and the Urbana Police Department. Four lighted tennis courts were added in 1970. A few years later, neighborhood residents were invited to discuss the future development of Blair Park. Some residents considered the park hazardous due to heavy street traffic and the location of its ball fields. There were no barriers to prevent children from running into the streets, nor were there any sidewalks near the play areas. Landscape architect Robert Callecod developed a plan that would retain the tennis courts and add wood-chip walkways, a basketball court, a tot lot, a west-side playground, and a fenced ball diamond in the southwest corner. The board voted in March 1973 to spend $2,400 on the first phase, which installed the tot lot between the two sets of tennis courts, a nearby picnic area, and a shuffleboard and horseshoe venue. raised viewing and scoring shelter at the east end of the lighted tennis courts. To reinforce J.C. Blair's contributions to the park district, an informational plaque was installed in 1999 at the corner of Florida Avenue and Vine Street. This stone and metal marker recounts J.C. Blair's career and influence both in Urbana and statewide. A similar marker was installed at Fort Massac State Park in Metropolis, which Blair was instrumental in establishing as the first state park in 1908. Today the park has fenced ball fields at the southeast and southwest corners and an unfenced ball field at the northwest corner. Along the west side, the Rourke Shelter serves two shuffleboard courts and hvo horseshoe pits as well as a single soccer goal. Along the east side are two sets of tennis courts: three courts to the south and four lighted courts to the north. A playground still separates the two sets of courts. The most recent addition to the park is the Ann and Ben Schrumpf Memorial, a walled seating area installed in 2001 that faces the north tennis courts. Asphalt and concrete sidewalks have replaced the wood-chip walkways, but even today there are no sidewalks along Broadway or Pennsylvania avenues. As with most of Urbana's parks, Blair Park is home to activities that use park district facilities but are run by other organizations. The Urbana Middle School uses the park for physical education classes, especially tennis, and the Kiwanis Club organizes Little League baseball. The Urbana Park District uses the ball fields and open fields for soccer and T-ball practice and games, and the shelter is the site for occasional outdoor summer concerts. The tennis courts have hosted local and regional United States Tennis Association tournaments and served as a home for lessons for years. "Disneyland type of playground" constructed in 1954 in Blair Park, image from 1957: Image courtesy Urbana Park District Published in Mancuso, Dana L. (Ed.). (2007). A century of growth: the Urbana Park District's first 100 years. Urbana, IL: Urbana Park District. 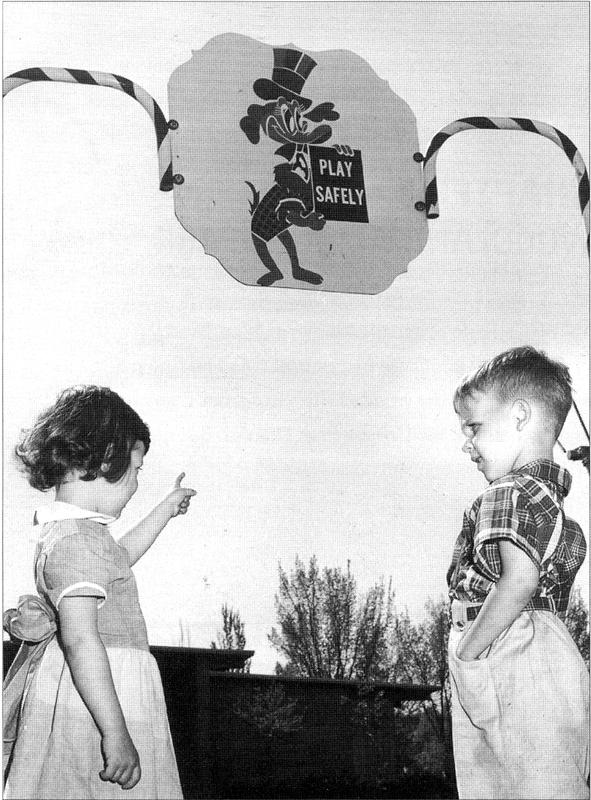 Image from 1957, two children at the Blair Park playground. : News-Gazette photo by Chuck Farmer, May 6th 1957 Published in Mancuso, Dana L. (Ed.). (2007). A century of growth: the Urbana Park District's first 100 years. Urbana, IL: Urbana Park District. 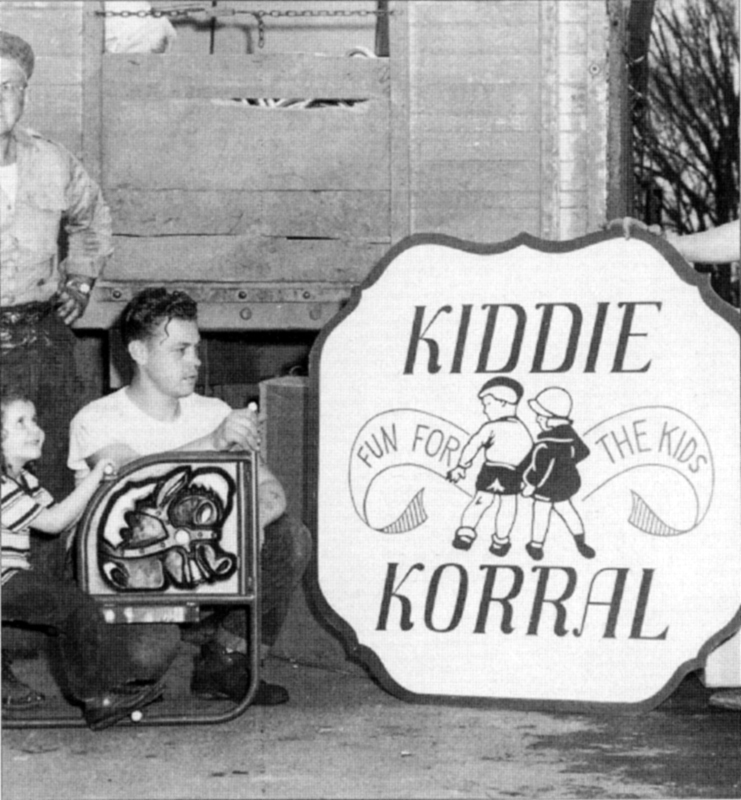 child playing on the "Kiddie Korral," : News Gazette photo by Chuck Farmer, May 6th 1957 Published in Mancuso, Dana L. (Ed.). (2007). A century of growth: the Urbana Park District's first 100 years. Urbana, IL: Urbana Park District. 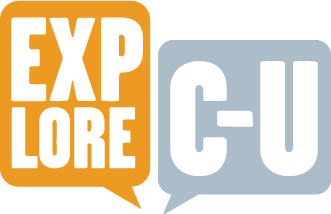 Urbana Park District, “Blair Park,” ExploreCU, accessed April 21, 2019, https://explorecu.org/items/show/125.